What to do with the pumpkin? EAT IT!! When I was little, we had a school trip to Garson’s Farm in Esher to go pumpkin picking. I found a mighty good pumpkin, it was big and round and perfectly symmetrical. I brought it home and showed it to my family beaming with pride. I went to school the next day and everyone had brought their pumpkins back to school for scary face making. I had to admit to the teacher that I didn’t have a pumpkin because we had eaten it for dinner. I cried a bit. I realise now that I was lucky to have experienced the delicious pumpkin dish and that it’s not actually that fun making an orange face with triangular eyes. Here’s the simplest pumpkin dish ever and it’s tasty too. Give it a whirl! 1. Pop the pumpkin in the microwave for 3 mins to soften a little and make it easier to chop. 3. 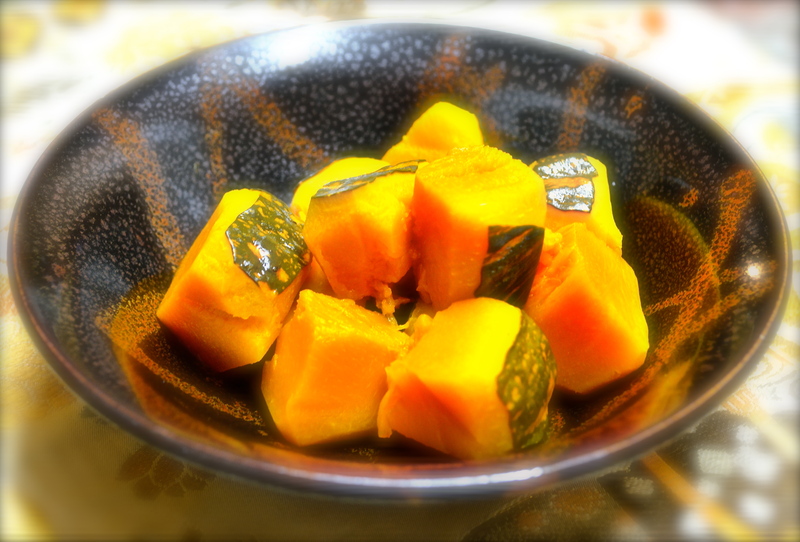 Place in saucepan, add liquid – it should be enough to nearly but not completely cover the pumpkin. 4. Bring to boil then place dropping lid/ baking paper/ a few sheets of kitchen paper over the pumpkin and turn down heat. 5. Simmer until almost all (but not all) liquid has been absorbed. Check pumpkin is cooked by gently stabbing with cocktail stick. It should slide easily.